No one thought to give him an armload of long-stemmed roses. 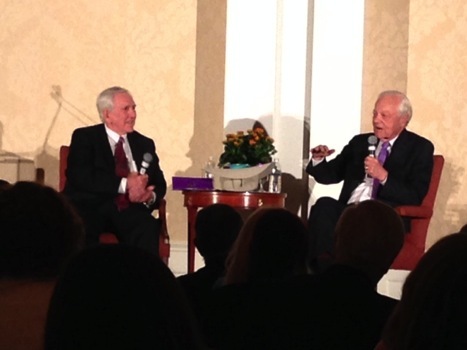 But the verbal bouquets kept coming at Monday night’s salute to Texas journalism giant Bob Schieffer. Presented by the revitalized Press Club of Dallas, “Bob Schieffer Milestones: A North Texas Tribute” drew a packed house of about 400 at the downtown Dallas Belo Mansion. The 79-year-old honoree, who learned his trade at the Fort Worth Star-Telegram and WBAP-TV before heading to CBS News, could hardly believe one particular sight. “When I was growing up, you didn’t see the mayor of Dallas and the mayor of Fort Worth in the same room,” he said. Fort Worth mayor Betsy Price and Dallas mayor Mike Rawlings were both in the house and bearing gifts. Price gave Schieffer a Stetson from her city’s Peters Brothers Hats. Rawlings countered with a gift certificate for a pair of specially monogrammed cowboy boots from his city’s Wild Bill’s Western Store. Both mayors also came with official city proclamations citing Schieffer’s indelible contributions. Schieffer, coaxed out of retirement to contribute to CBS News’ 2016 campaign coverage, also was lauded by the likes of former Republican U.S. Senator Kay Bailey Hutchison; ex-Dallas mayor Ron Kirk (who also served as the Obama administration’s U.S. Trade Representative); Dr. Kristie Bunton, dean of Texas Christian University’s Bob Schieffer College of Communication; and CBS11 anchor Doug Dunbar. Former President George W. Bush, CBS Evening News anchor Scott Pelley and CBS This Morning anchor Charlie Rose praised Schieffer via videotape. 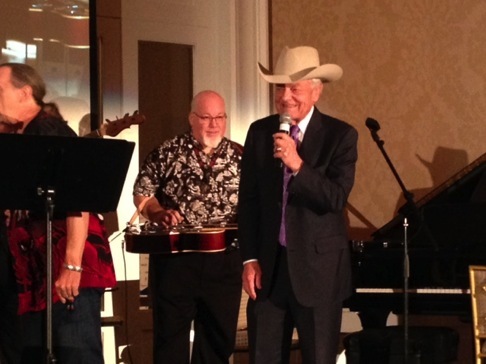 Tracy Rowlett, who anchored at both CBS11 and WFAA-TV, then quizzed the man of the hour about the ongoing presidential campaign before Schieffer re-donned his cowboy hat and cut loose with a closing song backed by the Texas Switchgrass Band. Kirk then one-upped her. “If you ever didn’t appreciate his class or his dignity, just turn on the news now,” he said. Schieffer has a “quiet confidence” and “brings the voice of stability” in a sea of social media excess, Dunbar said before hurrying off to co-anchor his station’s 10 p.m. newscast. Bob Schieffer and Tracy Rowlett go back & forth on Campaign 2016. He predicted an “extremely difficult” time for frontrunner Donald Trump if he doesn’t have the clinching 1,237 delegates needed for nomination at the Republican National Convention in Cleveland. But Texas senator Ted Cruz, intensely disliked by many of his colleagues, is no darling either, Schieffer said. “I think you’re more likely to have someone ask for the recipe for airline food” than see Senate Majority Leader Mitch McConnell endorse Cruz, Schieffer added. He recalled, somewhat fondly, the days of “whisper campaigns” alleging that a political candidate was having or had extramarital affairs. Back then, journalists would check the story out or just ignore it. Now “people just put it out there” on Internet blogs. “It literally has turned journalism upside down,” Schieffer said. Schieffer, who’s been with CBS News since 1969, also told Rowlett that he’s abandoned plans to write a book about Lyndon Baines Johnson, who even in an earlier era was no stranger to arm-twisting and shaking the money tree. “I’m just too old to start that project,” he said. Some money did change hands. Before Schieffer launched into his original country composition, “TV Anchorman,” the Press Club presented TCU with a $10,000 journalism scholarship in his name. Two dozen students from the Schieffer College of Communication were on hand to underscore the school’s continued efforts to groom journalists in the endangered art of fact-based reporting. Attendees at “Bob Schieffer Milestones” got it from a straight shooter Monday night. All sides could agree on that. 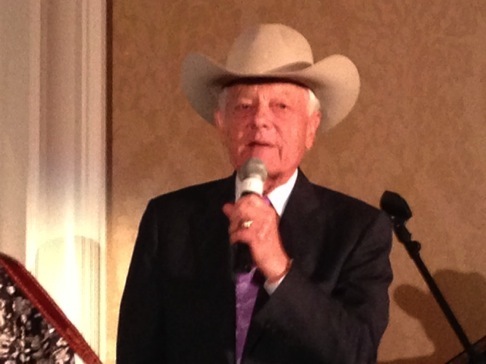 One more for the road: Bob Schieffer had quite a night. Note to readers: Your friendly content provider is a first-year member of the Press Club of Dallas board.